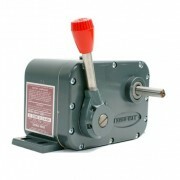 Zero-Max drives are mechanical adjustable speed drives. Five sizes provide constant torque of 1.3Nm to 22.5Nm (12“lbs to 200”lbs) throughout the speed range. Zero-Max drives are mechanical adjustable speed drives. Five sizes provide constant torque of 1.3Nm to 22.5Nm (12“lbs to 200”lbs) throughout the speed range. The speed range is infinitely adjustable from 0 to 1/4 of the input speed under full rated load . This is generally stated as 0-320 RPM under full rated load assuming an input of 1440 RPM. For lower speed/higher torque applications, some Zero-Max Drives are available with in-line or right angle gearheads. They may be connected to any rotating power source up to 2000 RPM. Speed adjustments are easily made by moving a lever control through an arc or turning the handwheel of a screw type control. In either case, precise speed control settings are possible.